Favorite Treehouse of Horror story? Every year on Halloween I have a very strict tradition I adhere to (although it may need to change starting next year). I have a good old scary (and not-so-scary) movie marathon. And that includes a run through of the horrific adventures of my favorite cartoon family, The Simpsons. 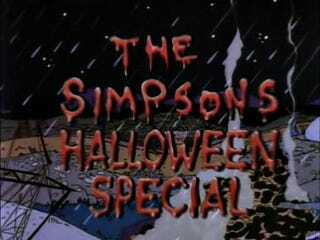 I think we can all agree that the Treehouse of Horrors episodes are perhaps the best episodes of the entire series. It frees up the writers to do whatever the hell they want, no matter how insane, and that usually leads to comedy gold (usually, but we'll get to that later). So I'm interested in what your favorite and least favorite Treehouse of Horror stories are. I have three favorites, and I honestly don't think I'll ever be able to say one is better then the others. The Raven - Classic Simpsons humor, but it really manages to keep the spirit of the original poem, being haunting and somber even with the usual Simpson hijinks still around. James Earl Jones as the Narrator is just gravy on top of perfection. Clown Without Pity - At 23 years old, I still have a fear of dolls. And it's all thanks to the Twilight Zone episode "The Living Doll" and the numerous movie and television plots it inspired. This episode exacerbates that fear, but it's still too enjoyable to miss. I find the image of a tiny Krusty the Clown (ugh, clowns) doll running around with a knife trying to kill Homer hilarious and terrifying at the same time. The Shining - From "No TV and No beer" to Groundskeeper Willie getting an Axe to the back (for the first time of the night) we all know this episode. It's an almost a perfect blend of parody and humor that can be enjoyed over and over and over again. My least favorite is easily The Diving Bell and the Butterball. Congrats, you made an 8 minute long fart joke with a random Spider-man parody. What the hell were they thinking with that?